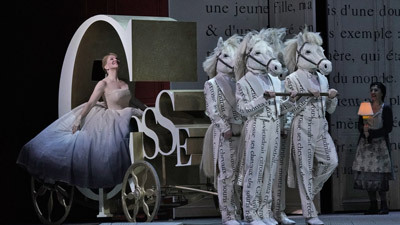 Massenet’s evocative opera about the struggle between worldly pleasures and the salvation of faith is something of a rare visitor to the Met stage. Only a handful of sopranos have sung the alluring title character with the company, and in the fall of 2017, Ailyn Pérez joined their ranks with a performance that combined lush lyricism and shimmering high notes. Opposite her as the conflicted monk Athanaël, Gerald Finely delivers his character’s stern remonstrations with a rich, impassioned baritone. Conductor Emmanuel Villaume evokes a vivid range of orchestral colors from Massenet’s score—which features the famous Méditation—and leads a cast that also includes tenor Jean-François Borras as Nicias and David Pittsinger as Palémon.